GOES-16 Satellite, 11/7/2018 Norther Plains Sunrise 7:44 A.M.
Today: Clear skies this morning will give way to partly cloudy skies this afternoon, with highs struggling to climb above freezing. Northerly winds will be calm, so although wind chill will be less of an issue, you will still want to bundle up. Clouds will continue to increase as we move into the afternoon hours. Tonight: Clouds will increase across the area as temperatures fall into the low 20s and teens. A disorganized system will clip the southwestern portion of our viewing area, bringing chances of snow. Accumulations are expected to be an inch or less in places like Custer, Edgemont, Pine Ridge, Chadron, Nebraska and generally, the Southern Hills. Given our cooler temperatures in the evenings, snow could gather on paved surfaces quicker than previous events this year, so we will monitor road conditions going into tomorrow morning. No major travel impacts are expected. Tomorrow: Leftover snow flurries could pepper the area before finally exiting around lunchtime. Some areas of sunshine will be possible, with northwesterly winds around 5-10 mph. Temperatures will be in the teens to start, reaching the high 20s and low 30s by the afternoon. By tomorrow evening, another chance of some snow flurries will be possible, with temperatures reaching the single digits in many areas. Friday and beyond: Single digit temperatures and a few leftover snow flurries will greet Friday morning, with plentiful sunshine most of the day. Temperatures will reach only the mid- to high 20s, and only the high teens for areas of the hills. Winds will shift southerly Friday afternoon and evening, bringing warmer temperatures in time for Saturday. Mostly to partly cloudy skies on Saturday with temperatures in the teens in the morning rising to almost the mid-40s by the afternoon. Veterans Day will see a slight dip in high temperatures, with another shot of snow flurries Sunday night into Monday. High pressure looks to set up next week, bringing above average temperatures and mostly dry conditions. 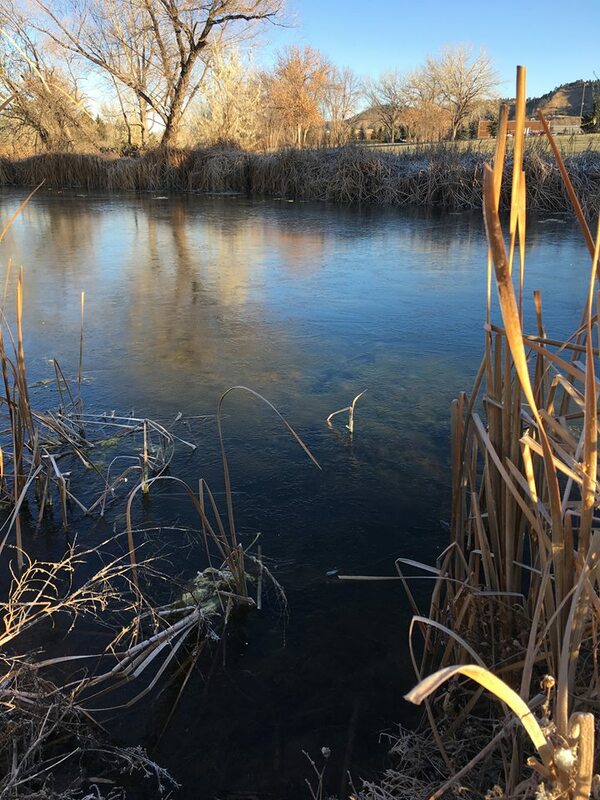 11/7/2018 Frozen pond outside of Rapid City – Thanks Samantha!